Arguably the UK’s most famous electric car has got to be the Nissan Leaf. It is the most widely recognised electric car out there; every other car you pass on the main road now is either an electric vehicle or a hybrid. We all are guilty at some point of having that opinion of electrics vehicles are “boring”, the stigma back in the day used to be correct, but when was the last time the phrases “danger”, “rally car” and “Batt Cave” sounded boring? No? I didn’t think they did. Not that I had a smirk on my face while writing this (it was from ear to ear), but I had the pleasure of finding out about the NEW Nissan Leaf that, it is due to be released at the end of this year. However as with the world of motoring, you always find that you aim for one thing and end up with another. The new Nissan Leaf brings a shift in electric motoring; the innovation of engineering has reached new heights. It is said to be able to reach over 200 miles. In a more down to earth second look it means 150-160 miles. From one charge! This is astonishing as back in 2011 when the original Leaf launched its 24 KW battery powered car it had estimations of 124 miles but really you were looking at an everyday drive of 90 miles. Same with the addition a few years ago of the 30 KW battery which estimated 154 miles but even the sales men I have spoken to, say you would be able to reach in the real world at around 120-ish miles. Let’s think about this, as this can open up a new world for those already invested in electric motoring, or lets think a bit bigger. I tend to class myself as a traveller, therefore I expect to be able to jump in any vehicle and be able to travel non-stop for at least two hours, which works out to an estimated 1.5 hours when you think about fast food and comfort stops, give or take. Now, I have always thought, I don’t have the time to waste sitting at service stations charging, or worse I would have to pre-plan my journey, and I do not have time to learn how to pretend to study a map. Therefore on second thoughts maybe electric is not a logical choice. Though I feel myself being swayed towards the new addition of the 40KW battery if the rumours are true, which is to be released alongside the new shaped Leaf in December 2017. And how do I know that. 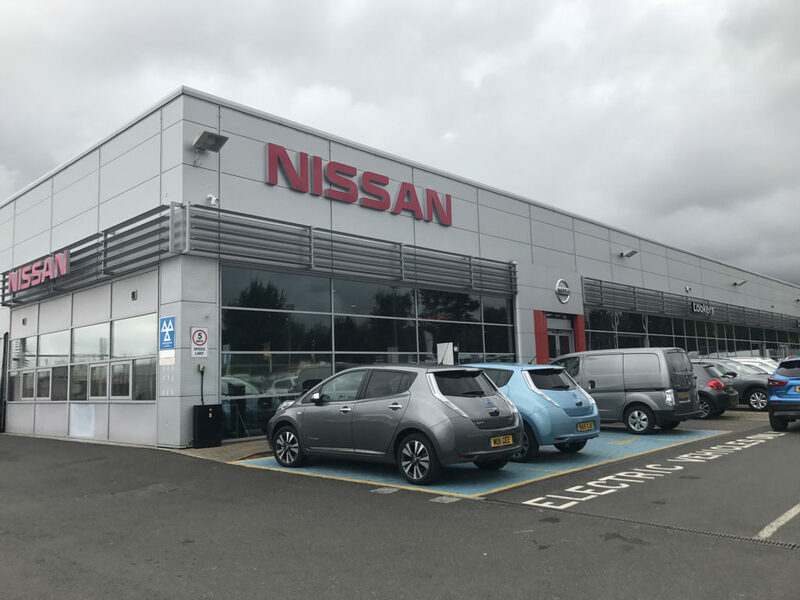 I took a little visit on over to the Lookers Nissan in Gateshead, who gave me a full insight into the world of Nissan and the Leaf. After a warm welcome and being introduced to everyone (and the espresso machine), I ran into John in the lunch room. I leaped at the opportunity to prey on a salesman when he was at his most vulnerable. John was very informative and pleasant, not what I normally expect from a sales man, which took me by surprise. 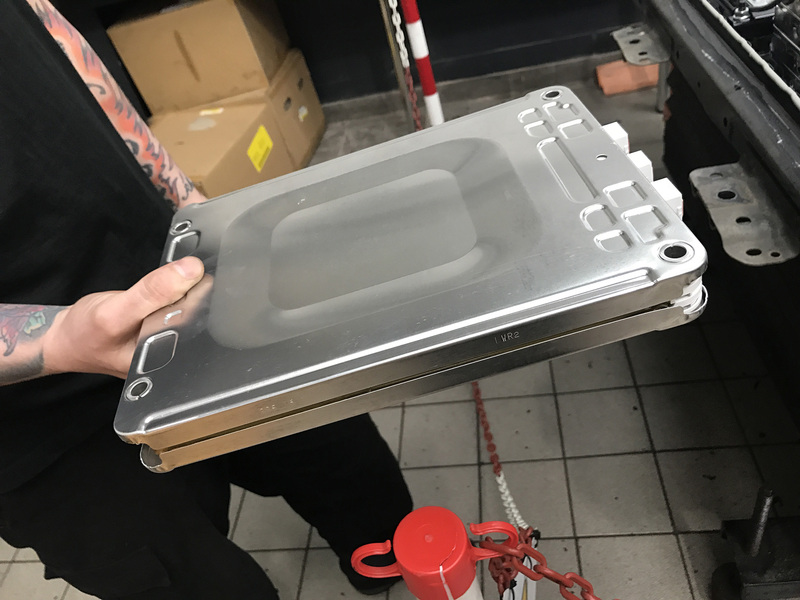 We chatted and I learnt that Nissan are planning on dropping the old shape Leaf to allow room for growth on the new shape, which is to be more “cutting edge” and give better driver/passenger performance than that already achieved. “The Nissan Leaf is still one of the best equip cars we sell in our range” – John, Lookers Nissan. Bold claim, so I decided to check this out for myself. Tony the Service Manager gave me a ride in one of the many Leafs sat nicely on a row outside the entrance. I needed to see what all the fuss was about. First thing first, that thing shifted. Oh my heavens this pushed me back into my seat quicker than I could say “1.21 Gigawatts”. Now I know why my other half says not to be fooled by them on starting lines. The torque this machine can produce is relentless. I have heard the story over-and-over-and-over about they produce all their torque instantly giving them amazing “get up and go” out of any junction (or from lights if your that way inclined). The comfort level, the attention to detail, and the performance, all put me in my place. I was honestly blown away with this little piece of ingenuity, and to know it is to be redeveloped and improved kind of made me a little excited for the future. Back at the dealership I was given the chance of inspecting a real Nissan Leaf in the workshop being stripped down to its shell. First I was introduced to two lovely gentleman (I am starting to wonder if 1920 styled manners are a requirement for Nissan employees) called Mark Thirtle and Barry Jaques. 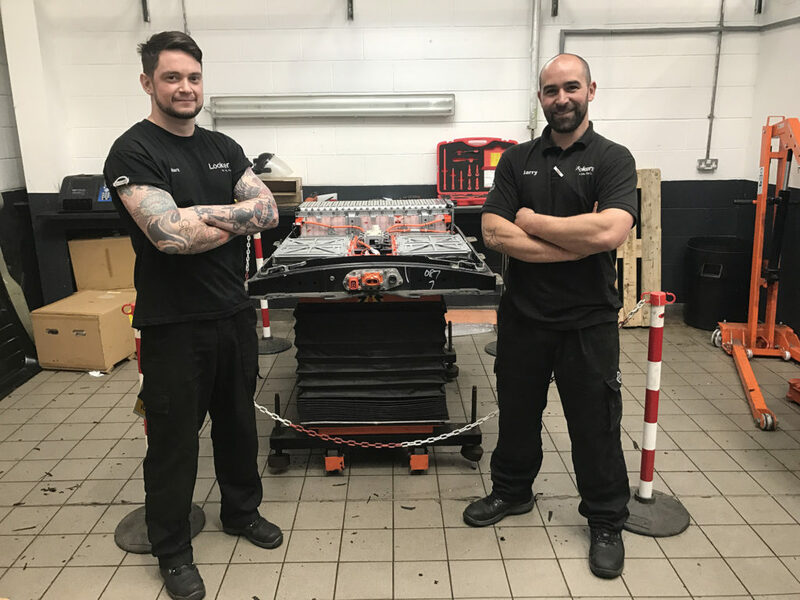 These gentlemen are the only two gentlemen outside of a Nissan Factory that are qualified and trained to work on the Nissan Leaf in the majority of Europe. I was already impressed. “It is like a big skalectrics,” Mark said to me when describing why he volunteered to become part of an exclusive club. Both Mark and Barry gave me a rare opportunity to see something only a selected few might see outside the secrecy of Nissan, their corner of the workshop, informally known as the “Batt Cave” (As in Battery). Taken from the fact that it is the only secure cordoned off specially made room. I was initially met with warning signs alerting me to danger and high voltage (Electric Six anyone). I made it passed the initial checks and I was greeted with a roped off area. This is apparently how they operate inside the workshop. Once an electric vehicle enters into the workshop extreme safety procedures must be taken. After all you are taking about a high-powered battery that has enough power to drive a vehicle head first into a tree, or just zap someone to death. All in all I was told if anything happened they do have an emergency “hook” they could use. No, this was not a joke, image little bow-peep, and your about there. The batteries I am told are never 100% safe. They had brought me to see a real-life battery from a former Nissan Leaf (tree related). Annoyingly they told me it was perfect, apparently these batteries are a little too reliable. In all their years of working on them they have never had one that has not had anything they couldn’t fix. For example, the one in the photograph is from the Nissan Leaf that drove straight on into a tree. The car was K.I.A but why was the battery ok? Because each battery has its own chassis. Mark informed me that the batteries themselves are so advanced that it if anything did happen to a cell, it can be traced back to the manufacturing. Until each battery cell is laminated inside the factory clean room, they will never touch human hands. The vast majority of the failures that Nissan has seen are down to contamination. Mark and Barry let me in on a real example of just how good these cars can be. 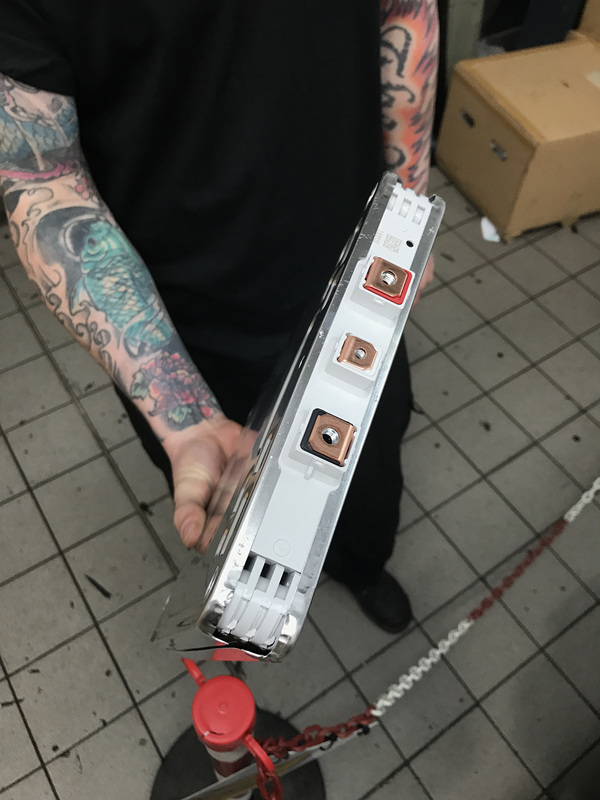 They have had two customers in their knowledge that have experienced a fault with the batteries. I should explain, the way most vehicles work now is they are cram packed with electric fancy goods that are too sophisticated for anyone to know what they do. Not Nissan. The computers inside these two particular vehicles detected faults with a cell, they then sent a message to Japan where they then contact the customers direct. Imagine for a second, Nissan direct, out of the blue; tell you, you have an issue with your car that the car itself is not alerting you to. Sound fishy? Yeah, the customers thought that too. They reached out to the Internet to ask if anyone else knew of this and no one had. This should show anyone reading this just how much customer care and effort this company is willing to stretch to for your safety. I have worked in the motoring industry for sometime now and have experience in a vast majority of each sector. Until this day I have not met a technician that drives a vehicle from the same manufacturer that they work for. 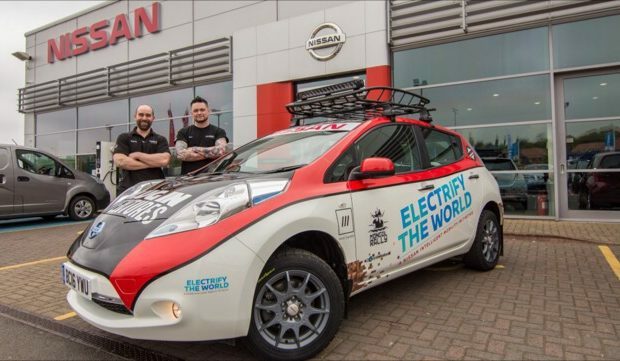 Both Mark and Barry drive Nissan Leafs. I don’t think I need to go any more into that, than that. As we kept chatting I found these guys don’t just deal with the ordinary Nissan Leafs, the privilege of being the only two in Europe leads me straight onto the Nissan Leaf Rally Car. You may have heard about this, but the part you properly didn’t hear is both Mark and Barry had the joy of assisting with the technical and mechanical making of this vehicle. Another headache in the making was a Nissan Leaf Limo. Yes, you read that right. Over in Barcelona Football ground they have a Nissan Leaf, which had to be shipped over to these specialists for urgent attention. Apparently converting a normal car to a limo is not easy as seen on Top Gear but it is made so much worse if it is an EV. The longest turnaround time these guys occur is up to a working week for any problem (minus tree related faults). I don’t think I can say that for a combustion engine vehicle.